To get to many of the pumping stations for the Tehachapi-Cummings County Water District, a private road on Tejon Ranch is accessed, providing a great view. The rotating screen helps clean any algae from the water and other debris, at the California State Aqueduct near Arvin. The Tehachapi-Cummings County Water District received a positive review in a recent Kern County grand jury report, which called it a state-of-the-art water district. This was due to the successful overall operations of managing all three fresh water basins in the Tehachapi area, maintaining dams to protect from flooding and using natural gas engines to pump more than 150,000 gallons of water per minute up from the California Aqueduct. “It allowed us to look at our operation from an informed outsider’s perspective," said Tom Niesler, district manager for TCCWD. "Iron sharpens iron and we believe that this review will benefit our district moving forward. The report highlights the visionary leadership of our board and the great work of our team." 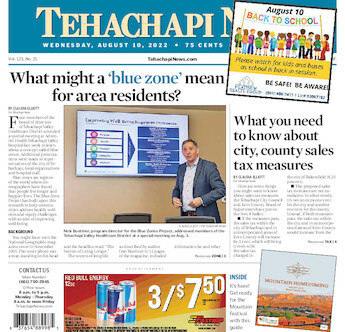 The district is the only watermaster over three basins from which all Tehachapi residents obtain their water for residential, commercial and agricultural purposes. Tehachapi, Cummings and Brite basins together yield more than 10,000 acre feet annually and are replenished with water from the California Aqueduct. The excess non-potable water from the aqueduct is filtered by natural aquifers, since there is no water treatment facility nearby. The allocation for the district is 19,300 acre feet per year, said the grand jury report. The amount allocated varies from year to year depending on what the district will receive from the state, even though the district pays for 100 percent of the allocation, according to information from a regular board meeting. The water is lifted from the California Aqueduct more than 3,425 feet up the mountains, or 31 miles away, to the Brite Basin reservoir, the only surface water storage in Tehachapi. The steel-coated pipeline brings water to the area and the 16 natural gas engine pumps from four remote sites use a Supervisory Control and Data Acquisition software and vibration analysis program to monitor equipment. All engines adhere to Air Pollution Control District emissions permits, said the report. The grand jury recommended the district research ways to purchase property in the Cummings Basin to help with increasing the district's recharge capacity and implement a computerized work order and backlog system for database tracking of repairs and scheduling maintenance activities. The district maintains three dams that were found without defects — Antelope Dam, Blackburn Dam and ID4. Flooding in Tehachapi was a constant threat, so these dams were constructed over the last 50 years to mitigate this problem. The TCCWD has an aging workforce, with several employees approaching retirement. In 2018, there were three new hires and two retirements. Current job descriptions are available for all positions. The district has 20 full-time employees and some part-time summer employees. Treated water is purchased from the California Correctional Institution and is sold to sod farmers and to the golf course in Stallion Springs. The district supports the California Water Fix Project. Until the Federal Emergency Regulatory Commission finalizes its part of the repair cost of the Oroville Dam Spillway, the district does not know its shared cost. However, it is estimated to be about $5 million. Outside and bulk water sales are available using a portable metering and locking system. Customers are billed on usage and consumption data is recorded for an annual report.